It all began with a dose of friendly sibling rivalry. Dave Purcell created a comic about a pair of anthropomorphic animal detectives; specifically a large dog and a small rabbit. Leaving them around the house, his brother Steve would finish the incomplete stories as a parody of themselves. Over time, Steve’s mocking of the characters eventually grew into his own full stories. In the 1970s, Dave signed over all rights to the characters to Steve on his birthday and Steve began to develop the characters in his own style. An early Sam & Max strip. 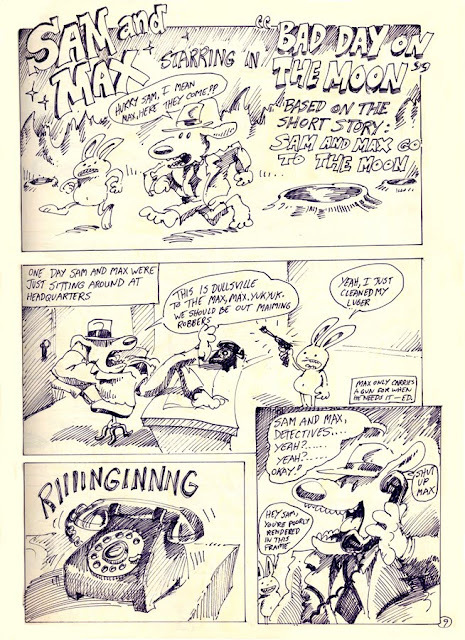 In the 1980s, Purcell produced Sam & Max comic strips for the weekly newsletter of California College of Arts and Crafts. Brought to the attention of Fish Police creator Steven Moncuse, Moncuse gave Purcell the chance to publish his characters in comic book form. 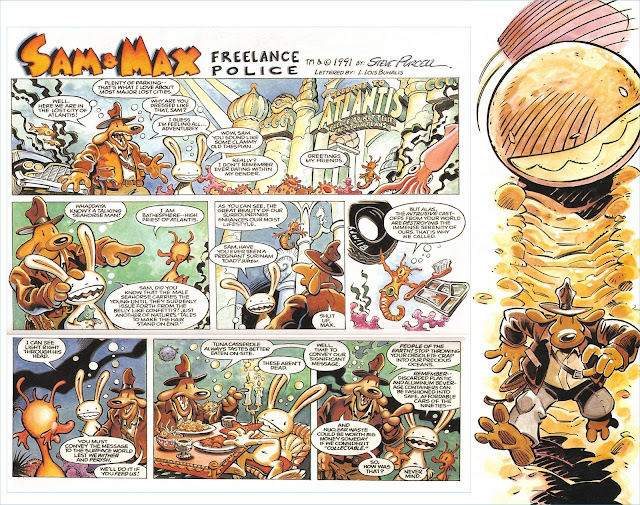 In 1987, the first Sam & Max: Freelance Police was produced and published by Fishwrap Productions. The comic, “Monkeys Violating the Heavenly Temple” was Purcell’s first full story with the characters and it established a lot of the persistent key elements of the stories and characters. Sam was a 6 foot dog who wears a suit and fedora like classic detectives to make people more cooperative when talking to a large dog. He was generally laid back, but had a warped sense of justice that made his mission to fight crime a passionate one. He was also a walking encyclopedia and was always willing to share what he knows in long-winded sentences--regardless of its accuracy--while also possessing ignorance to more practical matters. 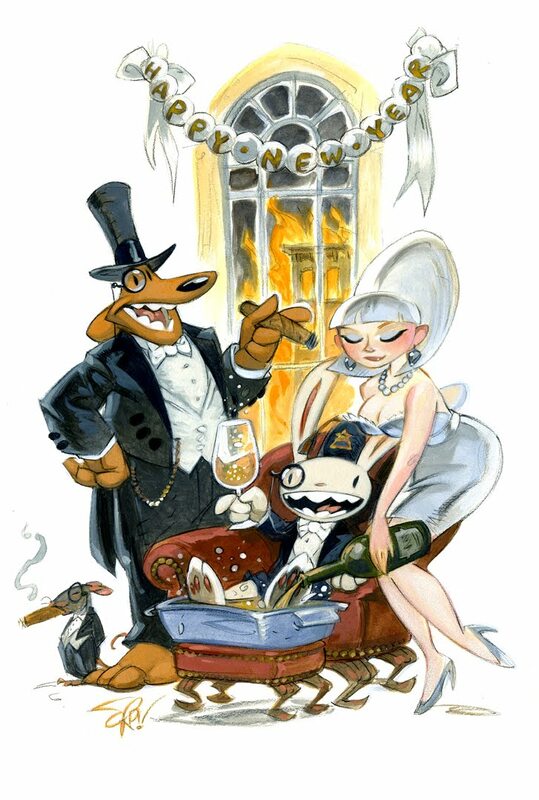 Sam and Max living it up for New Year's. Max was described as a “hyperkinetic 3-foot rabbity thing” with white fur. He always had a crazed grin and verged on psychotic. He enjoyed violence and had a “pinball-like stream of consciousness” coupled with a short attention span. Despite the fact that Max was naked, he managed to carry a wide array of items on his person. Sam & Max from The Adventurer parodying LucasFilm's Indiana Jones franchise. 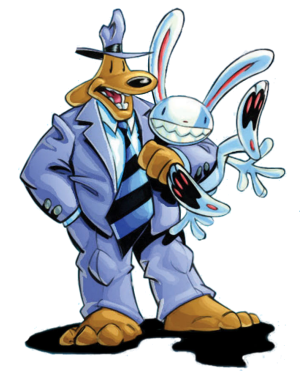 Sam & Max continued in comics through various publishers, such as Comico and Epic. In 1988, Purcell joined LucasArts as an artist and game designer and was asked to contribute to LucasArts’ new quarterly newsletter The Adventurer. The newsletter was targeted to customers to inform them about upcoming LucasArts projects and news. 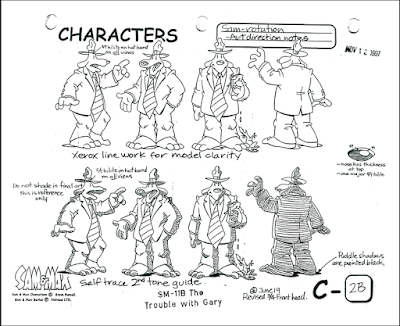 From 1990-96, Purcell created twelve Sam & Max strips which featured similar plots to the comics and parodies of LucasArts games and film franchises. 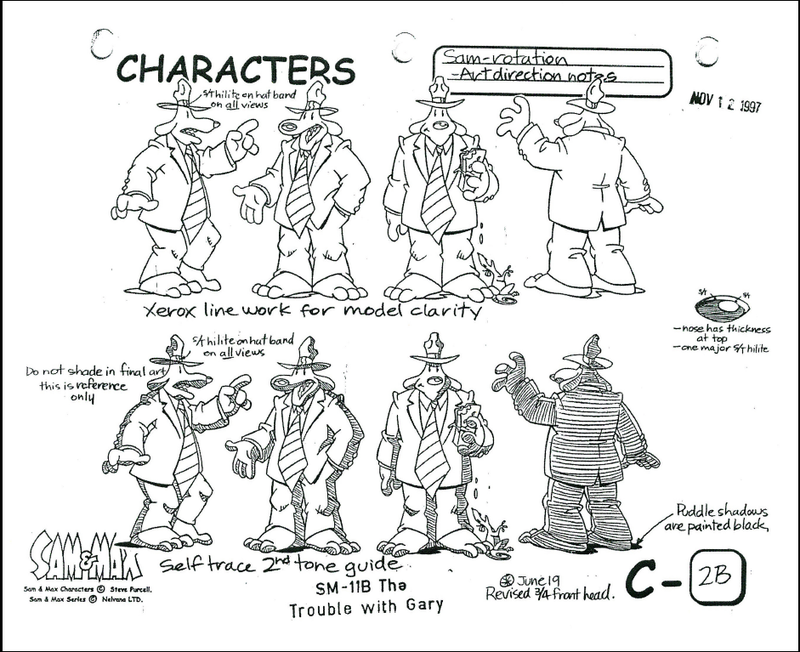 Sam & Max were also used as internal testing material for new SCUMM engine programmers SCUMM stood for Script Creation Utility for Maniac Mansion, a LucasArts-developed scripting language that was created to ease the development of the game Maniac Mansion and could be reused across various platforms. Sam & Max Hit the Road artwork. Based on the strip’s success in the newsletter, as well as the success of their previous games Monkey Island and Maniac Mansion, LucasArts offered Purcell the chance to create a video game around the characters in 1992. 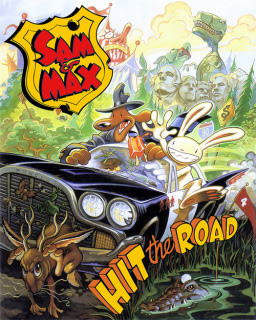 Developed by Purcell with Sean Clark, Michael Stemmle and Purcell’s future wife Collette Michaud, Sam & Max Hit the Road was partially based on Purcell’s 1989 comic “On the Road” and utilized the SCUMM Engine. It was released for DOS in 1993 as a point-and-click adventure game. A sequel was planned but soon abandoned. In 1997, FOX optioned the characters to be created in a new animated series. Produced by Nevlana and developed by Purcell (who also wrote several of the episodes), the series stayed true to the nature of the comics while toning some elements down for the targeted children audience. Based out of a dilapidated building in New York City, Sam (Harvey Atkin) and Max (Robert Tinkler) received jobs from the unseen Commissioner (Dan Hennessey) via telephone, which they would always fight over. Their cases ranged from serving as marriage counselors to the gods to stopping a rat infestation on the moon. Armed with devices cooked up by their resident tech expert Darla “The Geek” Gugenheek (Tracey Moore) in the Sub-Basement of Solitude, Sam and Max met any challenge with a degree of enthusiasm and insanity that always seemed to work out in their favor. Their primary mode of transportation was a convertible police car based on the DeSoto Adventurer. Max facial expression model sheet. Except for three episodes, every episode was comprised of two segments aired out of the intended production order. Stories typically parodied pop culture from movies like 2001: A Space Odyssey, Apocalypse Now and the James Bond series to literature such as Mary Shelley’s Frankenstein and Isaac Asimov’s I, Robot collection. The series was considered a success and even received the Gemini Award for “Best Animated Program or Series.” However, a second season was never commissioned and the show was ended after a single season. Despite its cancellation, Sam & Max went on to become a cult classic and endured in other media. A collection of all the Sam & Max comics and strips was released by Marlowe & Company in 1995 and again in 1996, before receiving a 20th anniversary release with new material in 2007 by Telltale. After a failed attempt to bring Sam & Max back to video games in 2001 when developer Infinite Machine went bankrupt, LucasArts began work on a new game, Freelance Police, in 2002. However, the game was cancelled due to “economic considerations,” much to the ire of fans. When the LucasArts license expired in 2005, Purcell took the franchise to Telltale Games, founded like Infinite Machine by former LucasArts employees, and began work on a series of episodic point-and-click games beginning in 2006. Max (Dave Boat) also appeared in Telltale’s Poker Night at the Inventory in 2010 and was joined by Sam (David Nowlin) for its sequel. From 2005-07, Purcell ran a webcomic for the series on Telltale’s website that earned him the Eisner Award for “Best Digital Comic” in 2007. “The Thing That Wouldn’t Stop It” (10/4/97) – Sam & Max have to stop a monster living inside Darla’s fridge from hurting people. “The Second Show Ever / Max’s Big Day” (10/11/97) – Sam & Max take a class of kids to space on career day where they encounter an alien bent on destroying Earth. / Sam & Max land on an island where the New Guinea Pigs think Max is their chosen one. “Bad Day on the Moon / Dysfunction of the Gods” (10/18/97) – Sam & Max head to the moon to help the rat people deal with a roach problem. / To keep from aging rapidly, Sam & Max have to reunite Zeus and Hera. “They Came from Down There / Big Trouble at the Earth’s Core” (10/25/97) – Mack Salmon’s Sea Chimp food products have turned a town into fish-like zombies. / Sam & Max save the Earth from the mole-men by lowering the Earth’s core temperature and finding them dates. “The Friend for Life / A Glitch in Time” (11/1/97) – Lorne kidnaps The Mad Thespian in order to get Sam & Max to hang out at his funhouse. / Sam & Max use a time traveling watch to muck with history, causing Sam to have never joined the Freelance Police. “That Darn Gator / Vice Squad” (11/8/97) – Sam & Max try to raise a baby alligator. / Sam & Max show what fun it is to put junk in your dad’s vice. “We Drop at Dawn / Christmas Bloody Christmas” (12/20/97) – Sam & Max look for the Commissioner’s keys in Central Park. / Sam & Max spend Christmas with Sam’s grandma at Blood Island prison, and the prisoners attempt a jailbreak. “It’s Dangly Deever Time / Kiss Kiss, Bang Bang” (2//6/98) – Sam & Max, using Darla’s TV, accidentally allow Dangly Deever’s evil twin freedom to take over the city. / Sam & Max try to stop T.R.U.S.S. from releasing an obnoxious tourist virus. “Aaiiieee Robot” (2/27/98) – Sam & Max send the Mega Max 3000 robot they used to stop a meteor to Japan to battle a giant baby. “The Glazed McGuffin Affair / Tonight We Love” (2/13/98) – Sam & Max try to convince Kent Standit to unban their favorite snack place Glazed McGuffins. / Sam & Max deliver an artificial heart to the President only to have their car stolen by a couple in love. “The Tell Tale Tail / The Trouble With Gary” (2/20/98) – Max’s tail is severed in an accident and the doctor brings it back to life as a monster. / Sam & Max babysit Gary, who can change things with his mind. “The Invaders” (2/27/98) – Two tiny aliens try to destroy Sam & Max. “Little Bigfoot / Fools Die on Friday” (4/4/98) – Sam & Max rescue a young sasquatch from life as a busboy. / Sam & Max have to save the Statue of Liberty from a blimp hijacked by Lorne. “Sam & Max vs. the Uglions” (4/11/98) – Aliens open a restaurant that literally serves people which Sam & Max have to close before the government uses a nuclear solution. 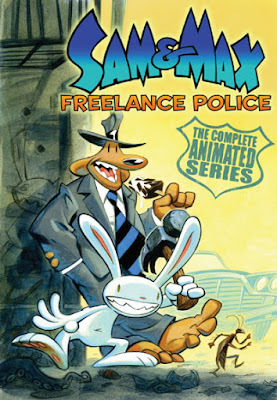 “The Final Episode” (4/25/98) – All of Sam & Max’s former foes, led by Mack Salmon, attempt to get revenge on the Freelance Police. “Our Bewildering Universe! : Chock Full O Guts” (short) – Sam & Max describe the human body. 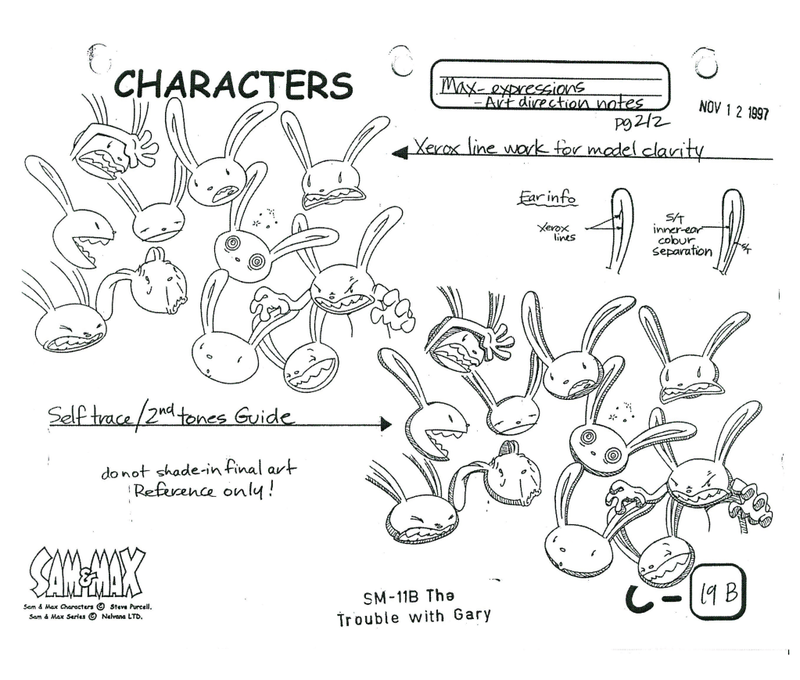 “Artsy Craftsy Bit Of Time-Wasting Nonsense” (short) – Sam & Max show how to make a Max paper bag puppet.